If you've been reading my blog for a while, you'll know that I reviewed some lovely brushes, a makeup brush holder as well as a makeup sponge by Nanshy. I can't recommend their brushes enough. They're are such great quality and are pretty affordable as well. You can view it here. I had such a great response for that post as well as alot of emails asking me more about the brushes. I am happy to say that Nanshy were kind enough to hold a giveaway on my blog and give 2 of my lovely readers to try out some brushes. 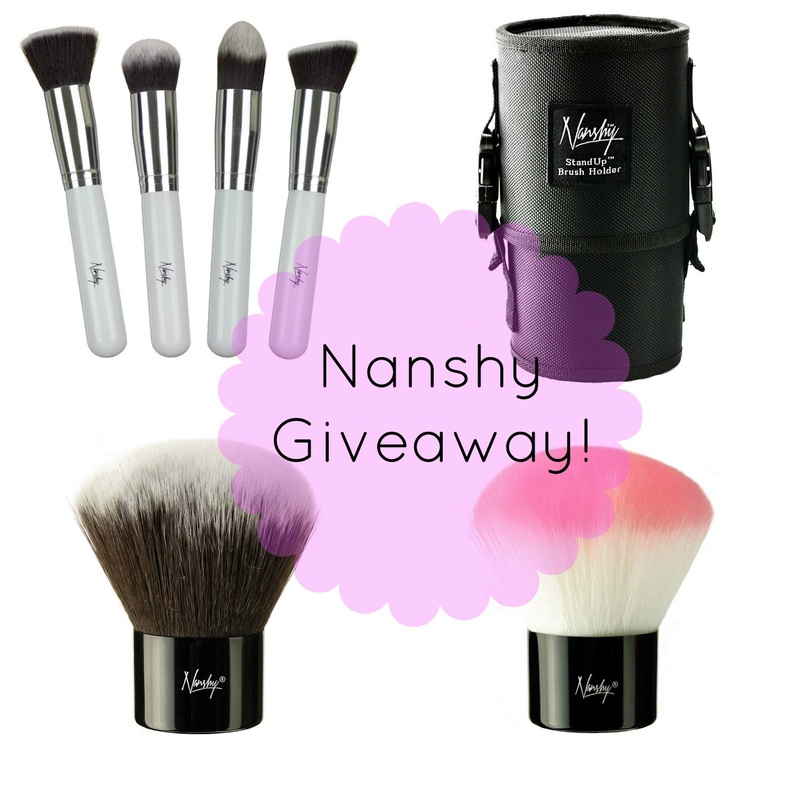 The first winner will receive the Nanshy foundation brush set as well as the brush holder (which I previously reviewed) and the 2nd winner will receive two of the new kabuki brushes which look so cute! You mush follow Nanshy via twitter, Facebook, Google + or YouTube. Any one is fine. I will be checking this! :) Also, leave your email or twitter handle below! I currently use my fingers to do my makeup as the brushes in general are too expensive for me to buy. This would definitely help my makeup! I've been after the Nanshy Foundation Brush Set for so long now - keeping my fingers crossed that I get lucky! I really need some better quality brushes! Find myself using my fingertips rather than my current set half the time! It would be great to try some new brushes which aren't real techniques ect.! I would love to win these brushes, I have been wanting to try them for a while. i would love to win these amazing prizes mostly because I'm new to beauty blogging and i could always use the extra products/brushes to review and comment about! Awesome Giveaway! I really want to try these out, they look comparable to Sigma brushes. Oh, I'd LOVE to enter !! I really want to try this brand.. Good luck everyone! gorgeous prizes! whoever wins would be sooo lucky! My brushes are looking a little tired. I'm currently trying to build up my collection of makeup brushes & these look great! Im starting to build my brush collection and this set would be perfect for the job! Great giveaway! But I really wanna try out some new brushes, I hope I get to try these!! I need a new set of brushes! Soon I want to do makeup on others, try to make a little extra money. So I need a new set of good brushes, but good brushes are quite expensive!! I really got my fingers crossed!! these brushes look amazing! i always love expanding my brush kit as a makeup artist its one of my beauty obsessions! & these look like they would apply foundation like a dream! I'd love some professional quality makeup brushes. At the moment, I'm using the applicators which come with kits and they just don't compare. I've two small kids so splurging on posh makeup brushes isn't a priority at the moment! I'd love to win because I've never tried any professional make-up brushes and have always wanted to try so! Lovely giveaway! i love nanshy brushes and would like to try the kabukis! !